Despite being a relatively new field of oncology, immunotherapy has come a long way in a short time. In fact, Science Daily recently reported that immunotherapy doubles survival rates for patients with melanoma brain metastases. The journal reported on investigators at Brigham and Women's Hospital who evaluated data from more than 1,500 cancer programs across the UK to gather a large enough dataset to determine the effectiveness of checkpoint blockade immunotherapies. The report found that checkpoint inhibitors increase median survival to 12.4 months, and more than double percentage of patients who survive four years or longer. AFL star Jarryd Roughead is one name you may know who is a survivor. Roughead underwent eight months of immunotherapy treatment before declaring himself cancer free. Roughead, who recently backed a push to get more Australians on next generation treatments, is just one of a growing number of people benefitting from the treatment. The Hawthorn Football Club captain, along with Australian of the Year Ian Frazer, will lead the Helping our Health awareness campaign as part of a $248 million boost for clinical trial activity. Furthermore, in the US, Facebook co-founder and billionaire Sean Parker committed $250 million to six US cancer centres to help speed up cancer immunotherapy research. It seems altruism in this field is alive and well across the globe. So important is this burgeoning field of immunotherapy medicine that it has been recognised in this year’s Nobel Prize in Physiology or Medicine. The prize has been awarded to two immunologists — James P. Allison and Tasuku Honjo — for their respective work on two different molecules. Allison, a professor at The University of Texas M.D. Anderson Cancer Center, discovered that CTLA-4 acts as a ‘brake’ on the immune system. Inspired by Allison’s work with CTLA-4, Honjo developed his own therapy, PD-1, that is safer and more effective against a number of cancers. 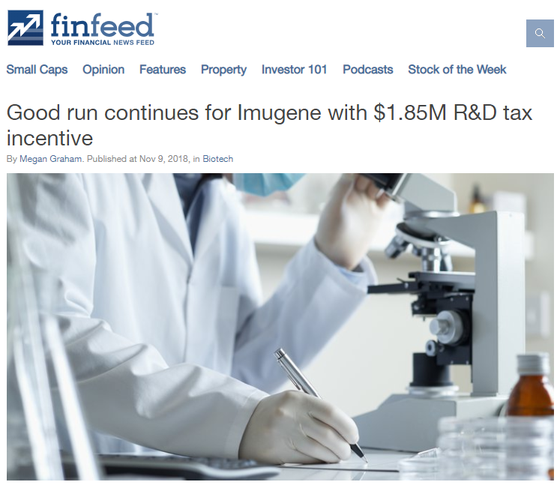 Imugene (ASX:IMU) is a clinical stage life sciences company on the cutting edge of this very field and is developing vaccines to boost and direct the immune system to target and attack cancer cells. Interestingly, its top management has direct links to Noble Prize-winner Allison. IMU’s non-executive director Axel Hoos worked closely with Allison in 2011 as directors of the Cancer Research Institute’s (CRI) Cancer Immunotherapy Consortium (CIC). Hoos is also Senior Vice President and Therapeutic Area Head, Oncology R&D, at big pharma mainstay GlaxoSmithKline (LON:GSK). Hoos is just one of several leading scientists on IMU's beefed up Board of Directors and Scientific Advisory Board (SAB), which includes Europe’s leading oncologist and researcher Dr Josep Tabernero; former Head of Clinical Pharmacology at Roche (SWX:ROG), Dr Mark Marino and former Vice Chair and Section Chief for Medical Oncology for the Division of Hematology/Oncology in the Department of Internal Medicine at Arizona’s Mayo Clinic, Professor Tanios Bekaii-Saab. 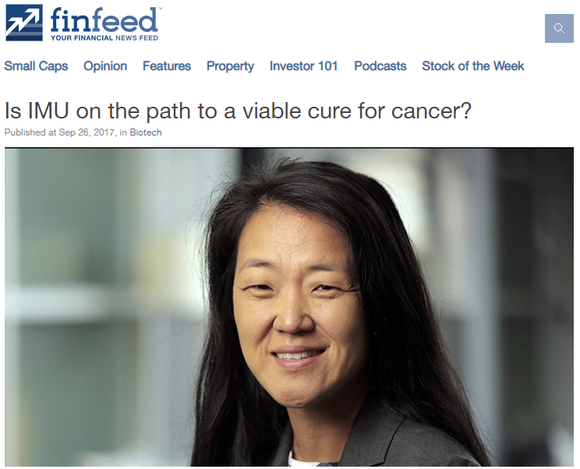 Managing Director and CEO, Leslie Chong, and her extensive experience in immune-therapy including lead roles for biotech majors Genentech/Roche and Exelixis, have no doubt helped bring such a team of high-level... industry oncologists and researchers together. Yet, perhaps the biggest feather in this (small) cap is its Chairperson, the so-called ‘bioentrepreneur’ Paul Hopper with connections to pharmaceutical giant Merck. Hopper led Viralytics (formerly ASX:VLA) to a $502.4 million buyout by pharmaceutical giant, Merck & Co (NYSE:MRK) earlier this year — at a ~160% premium to the average share price when the offer was made. And all that on the back of just one clinical oncology drug, CAVATAK®. IMU is hoping for similar things from its Chair and its latest news may be just the kickstart it needs. Today, IMU announced that its HER-Vaxx Stomach Cancer Immuno-oncology Trial is advancing to Phase II, beginning early 2019. Regulatory submissions are underway, and Phase I/b results are expected next month. Importantly, Phase I/b showed zero safety issues, and all dose levels generated antibody responses in patients. Manufacturing of HER-Vaxx Phase II is complete and the Phase II dose has now been determined, with the product ready and waiting to be used in the second phase in the new year — a major milestone for any small-cap biotech. While there’s plenty of news flow to choose from, first cab off the rank is today’s major news regarding Imugene (ASX:IMU) HER-Vaxx trials. The HER-Vaxx is a drug candidate that’s designed to produce an antibody response against a cancer growth signal receptor protein called HER-2, found on the cell surface in breast and gastric cancers. The video above also covers IMU’s strategic partnership with Ohio State University. IMU acquired two new assets through a licencing programme with Ohio State University and Mayo Clinic – Key-Vaxx and B-Vaxx which it hopes to put through clinical trials next year. We will look at these candidates in more depth shortly. IMU has been waiting patiently for results from its Phase I/b HER-Vaxx clinical trial for gastric cancer. And it was worth the wait. Phase I/b successfully tested three doses of HER-Vaxx (IMU-131), in combination with current standard of care chemotherapy (Cisplatin and Fluorouracil or Capecitabine). Researchers observed no safety issues and confirmed immune responses at all dose levels. Things went so well, in fact, that the CRC (Cohort Review Committee) selected 50ug as the recommended Phase II dose, which was the highest dose trialled in Phase I/b. Essentially, all HER-Vaxx vaccinated patients developed the desired immune responses and antibodies to the HER-2 target protein. That said, full top-line results are expected to arrive in December. Preparations are now underway to begin Phase II of the study. The amount of HER-Vaxx product required for the second phase of trials has already been manufactured and are now ready and waiting for things to kick off in the new year. IMU’s major milestone Phase II trial will test the efficacy, safety and immune response in 68 gastric cancer patients with metastatic gastric cancer overexpressing the HER-2 protein. It will be randomised into two arms of either HER-Vaxx, plus standard of care chemotherapy, or just standard of care alone. The primary ‘endpoint’ will be overall survival, with the secondary endpoint to be ‘progression-free survival’. IMU has selected site locations across Asia, Eastern Europe and India, several of which have a high prevalence of gastric cancer and for the fact that clinicians and patients have difficulty accessing existing treatments. There have been over one million new cases of stomach cancer in 2018 so far, according to the World Cancer Research Fund. Sadly, treatment for stomach cancer is often palliative, because stomach cancer is typically found at an advanced stage, meaning it can be difficult to cure. For this and other reasons, there is a strong demand for better treatment options for stomach cancer, and IMU has chosen locations for the Phase II trials where demand is likely to be particularly high. In June 2018, IMU signed an exclusive world-wide licence to the entire body of cancer vaccine work and intellectual property developed by Professor Pravin Kaumaya of the Ohio State University Wexner Medical Centre and Dr Tanios Bekaii Saab of the Mayo Clinic. Dr Kaumaya’s work in this field aligns well with IMU’s existing platform and portfolio. The deal took the company from a one product, one-trial focused play to a substantial intellectual property estate — with a total of six patent families comprising 16 patents or pending applications for a large range of B-cell peptide and cancer vaccines. Of these, B-Vaxx and KEY-Vaxx are of particular interest as clinical candidates for IMU, and it has big plans to put KEY-Vaxx through the next stage of clinical trials in 2019 in its goal to create the pre-eminent, dominant position globally in B-cell peptide vaccines and therapeutics. Note that KEY-Vaxx is indicated as a ‘PD-1’ type of candidate. Nobel Prize winner Honjo’s 1992 discovery of a T-cell protein, PD-1, was inspired by Allison’s work and went on to become a target in the treatment of cancer. IMU now has its hands on a candidate that is targeting PD-1, in addition to its flagship HER-2 specific vaccine, HER-Vaxx. And, as shown in the graphic above, the acquisition also means the possibility of trialling HER-Vaxx with its new PD-1 drug, KEY-Vaxx. Interestingly, it has been found that the combination of the PD-1 vaccine with the acquired Phase II Her-2 vaccine significantly inhibits tumour growth compared with mAb control in a Her-2+ model of colon cancer. Another key reason this partnership is important is pharma drugs Keytruda (Merck) and Opdivo (BMS), both targeting PD-1, sold for US$3 billion and $4 billion respectively in 2017. Big pharma is clearly looking for novel combinations or elusive blends of drugs that combine without increasing toxicity, and with minimal cost increase and resulting in better response rates. IMU’s cancer vaccines look to be on track to tick all those boxes. Up there with a solid clinical pipeline, quality management is vital for small cap life sciences companies. Since early August, IMU has announced no less than four key appointments. Each of these additions is a big catch for a company the size of IMU. In late August, Dr Mark T. Marino was appointed Chief Medical Officer (CMO) to lead global clinical development, regulatory and medical monitoring activities. Marino has held senior level clinical development/leadership positions at top tier pharmaceutical companies like Daiichi-Sankyo, Hoffman-La Roche AG, and Novartis Pharmaceuticals Corp. Following that, Professor Tanios Bekaii-Saab of the Mayo Clinic College of Medicine and Science was appointed to its Scientific Advisory Board (SAB) in September. Bekaii-Saab previously owned (along with Professor Pravin Kaumaya) the cancer vaccine work and IP which IMU bought in June, giving it rights to KEY-Vaxx and B-Vaxx among others. In October, IMU added in Kaumaya, who works at Ohio State University Comprehensive Cancer Centre, to its SAB. Kaumaya has developed multiple cancer vaccines, is a recognised world leader in cancer vaccine research and author of more than 130 peer-reviewed articles. Just days later IMU appointed to its SAB, world-renowned oncologist and researcher Dr Josep Tabernero — the President of the European Society for Medical Oncology (ESMO). ESMO is the world’s leading professional organisation for medical oncology, with 18,000 members representing 150 countries. 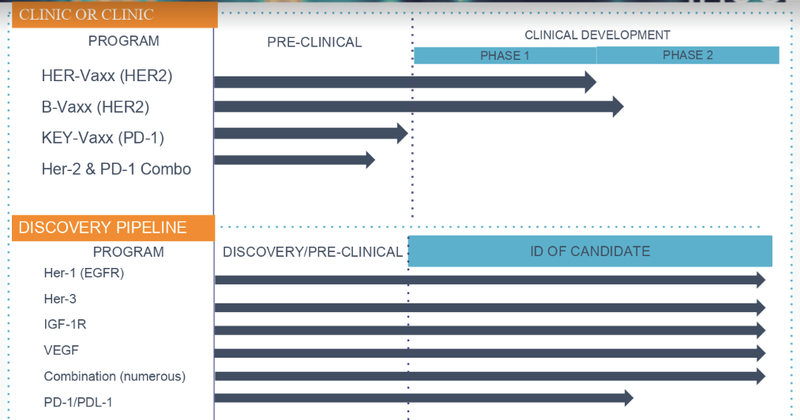 The appointment of Tabernero, a widely acknowledged world leading oncologist and researcher, would be a major boon for any life sciences play, let alone a small cap like IMU. As we mentioned earlier, IMU also boasts Dr Axel Hoos on its Board, who holds the enviable position of Senior Vice President and Therapeutic Area Head, Oncology R&D at GlaxoSmithKline Pharmaceuticals. Perhaps of even greater significance than holding such a senior position at GSK, is the fact that Hoos was the clinical lead on the first checkpoint inhibitor, CTLA-4 or ipilumumab (Yervoy), which was approved while he was working for the team at Bristol Myer Squibb. Adding to the weight of the highly credentialed team is Leslie Chong, who has been integral as company CEO for two years, was also made Managing Director in March of this year. Chong has been in cancer research and development for more than 20 years, with a particular focus on the field of cancer immunotherapy. Her experience includes nearly five years at Genentech serving in the role of Senior Clinical Program Lead — which included crucial work on a number of now marketed cancer therapies, most notably an immunotherapy drug called Atezoluzimab (Tencentriq). Atezoluzimab is an anti-PD-L1 that was approved in 2016. Prior to that, Chong worked in Lead roles for biotech big names Roche and GSK. With such an extraordinarily experienced and top tier team working towards its success, the market could be feeling more optimistic as results continue to come in. Another encouraging sign comes in the form of a $1.85 million R&D tax refund as part of the Australian government’s R&D tax incentive scheme. The funding will go towards IMU’s commercial and clinical milestones, with the company experiencing its most significant period of R&D expenditure in the September 2018 quarter — when R&D outflows totalled $1.65 million. In June, IMU completed a large capital raising, to the tune of $20.1 million via an institutional share placement and non-renounceable rights issue and an entitlement offer to existing shareholders. It then reported net cash of $23.8 million as at 30 September, largely thanks to the raise. That’s more than enough to see IMU through the end of current planned trials. At the time, it represented the biotech sector’s biggest cap raise, outside of the $30 million raised by Viralytics at the beginning of 2018. We can only assume this means that Paul Hopper really knows what he’s doing, and has networks of institutional or sophisticated investors who believe so too. IMU is now gathering some serious data for HER-Vaxx, which could see it partner with Big Pharma for an attractive price if Phase II goes well. At the same time, it has made its own acquisitions of IP and new drug candidates to diversify its portfolio, which could further attract a partner. It’s added plenty of top new talent, who are not only highly credentialed but also well connected in the life sciences and oncology fields. IMU as a company has grown and matured in the last 12 months and from where we stand, looks to have plenty more growth to come.